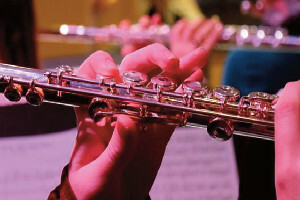 If you play a woodwind, brass or percussion instrument to Grade 3 or above and would like to play in a Swing Band or Flute Choir, then why not come along to Sunday Afternoon Music! These two groups meet approximately once a month on a Sunday afternoon from 2.30pm – 5.00pm at the NTU Clifton Campus, NG11 8NS. The cost for the Spring term is £20, this can be paid online via the links above, or by cheque or cash at the first rehearsal. Access is via the main gate on the A453 and parking is in the main visitor car park on the right hand side next to the cricket pitch. You can email the office at admin@music-for-everyone.org for more information about the upcoming term.